Hello readers! 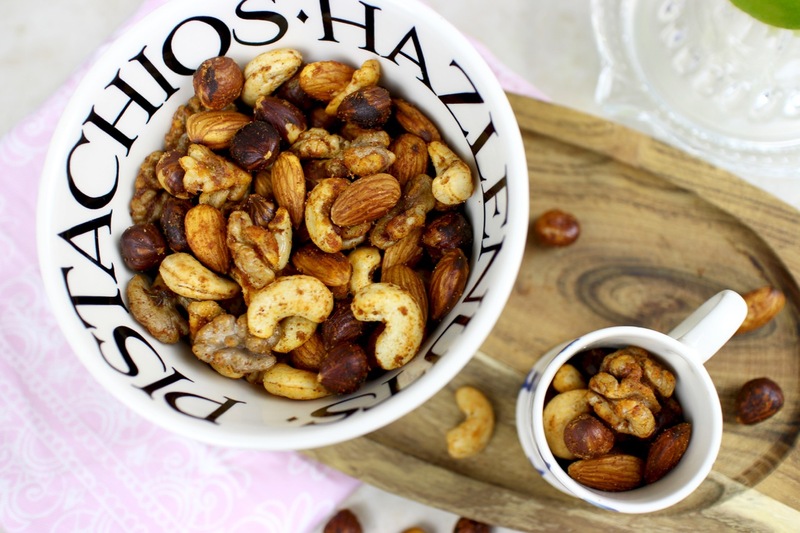 I’ve got a really quick but exceedingly delicious recipe for you today, providing the perfect snack to munch away on at home or to throw into a lunchbox as a lovely savoury snack. Ladies and gents, I give you my Smoky Paprika and Lime Nuts! These are really lovely. The first thing you’ll taste is a hit of salty but acidic lime, followed by a bit of heat from the paprika; the final flavour is that of light smoke and the taste of the nut itself. I really like them as a savoury snack, particularly because I was getting so bored with munching on plain nuts. You can use any nuts you like for this. 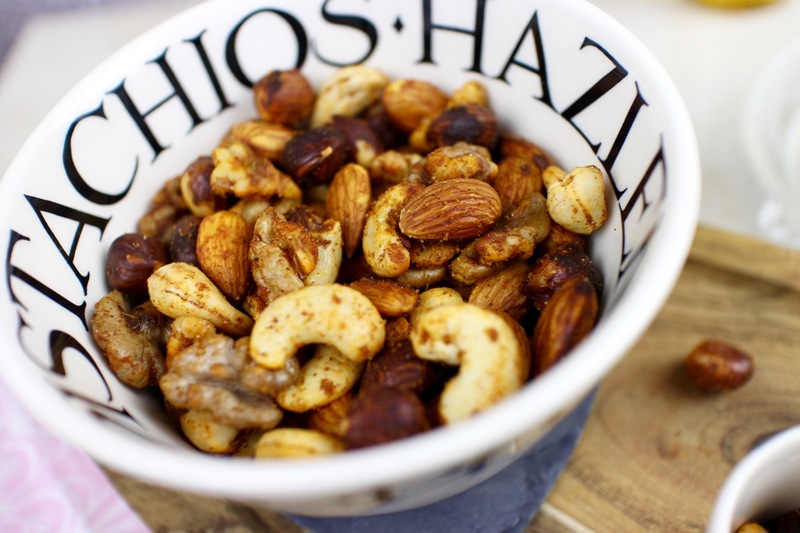 I’ve used a mixed nuts selection from a local supermarket, but you could use just one type (cashews or almonds are particularly delicious) or if you’re feeling flush you could use a deluxe nut mix that includes more expensive nuts such as pistachios and macadamias. It’s completely up to you! You may think I’ve used that little tiny cup as it makes for a pretty prop, but it’s more than that! It contains what I would define as ‘one portion’ of these nuts; 25g or around 15-20 whole nuts. This comes to just under 150 calories, an amount I would usually define as the limit for a healthy snack. A quick word about the oil… I’ve used Yare Valley Oak Smoked Rapeseed Oil. 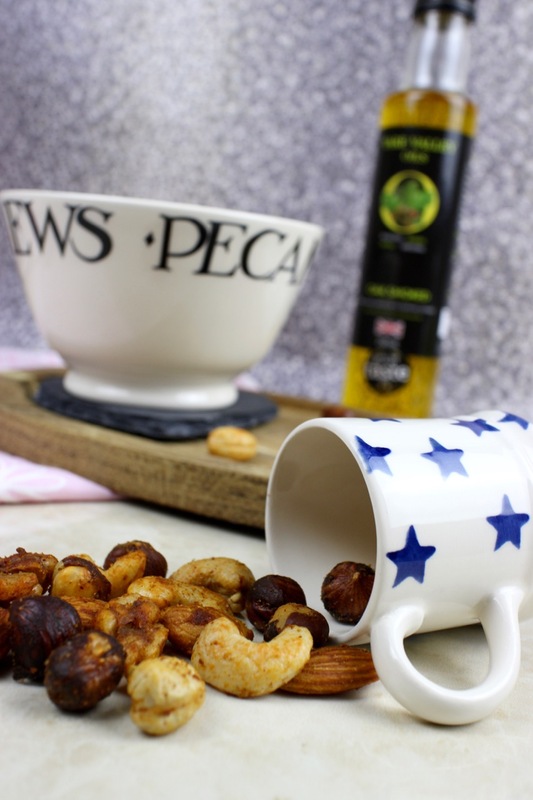 It gives these nuts a lovely enhanced smokyness but if you can’t get hold of it, you could just use olive or vegetable oil and add an extra dash of smoked paprika to compensate. Of course, you’ll get a little more heat then too but hey, you can’t have it all ways! Finally, before we get to the recipe, I do need to ask you all what you think of the bowl… Cool, eh? Both the bowl and tiny cup are by Emma Bridgewater, my latest crockery obsession. This bowl is probably one of the most sought-after EB pieces right now too despite it being brand new. “Why’s that?” I hear you ask; well, it’s the spelling mistake of course! This has caused quite a stir amongst EB collectors as it has the potential to become a collector’s item since EB are no longer selling them. It’s not currently clear whether the unsold bowls will be destroyed or released as seconds, but one of them sold for almost 4 times the initial sale price on eBay yesterday, so I’m guessing this little bowl could become quite valuable! I’m not telling you what the mistake is, I want to see if you can spot it. If you can, leave me a comment below. A 10-minute snack that’s perfect for nibbling whilst sitting in front of the TV or enjoying drinks with friends. They won’t believe you made them yourself! 1. Place the nuts, oil, paprika and salt into a pan over a medium heat. Roast for around 5 minutes until hot and toasty. 2. Remove from the heat, throw over the lime juice and zest then stir really well and tumble out onto a plate to cool. 3. Once cool, enjoy immediately or store in an airtight container for up to 1 week. Note: Nutrition information is indicative only and will vary depending on exactly which ingredients you use. I could eat a tonne of these right this minutes! They look delicious! I spot it!! You just might be able to make your millions from that bowl Kevin! These nuts sound super tasty, right up my street! If I made these I'd eat the lot in one sitting! Danger, danger, Will Robinson!